Discover the Glow on the Go Kit from Emma Hardie, a radiance boosting skincare set to protect skin from environmental damage and reveal a healthy, radiant glow. A moisture-packed, skin soothing facial mist to add hydration, luminosity and environmental protection to the skin. This ultra-fine, lightweight formula contains soothing Aloe Vera, Velvet Flower to help soften, and Wild Watermint to tone and moisturise dehydrated skin. Hyaluronic Acid floods the skin with hydration and plumps fine lines. Glycofilm™ technology provides a 'second skin' to protect cells from the damaging effects of daily pollution and provides invisible colour correction to balance redness, leaving skin fresh and radiant. A lightweight, non-greasy skin protecting and priming cream with a broad-spectrum sun protection SPF30, that gives the skin eight hours of daily protection against UVA and UVB damage. Specially formulated with Mongongo Oil, Oat Extract and Vitamin E to help protect and guard the skin from premature ageing, sun damage and environmental exposure. 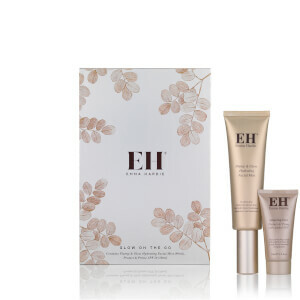 Doubled with a unique light diffusing formulation to help prime the skin, even out the complexion and blur the appearance of fine lines and pores. Mist: Mist over skin throughout the day to refresh and hydrate, or use day or night before applying your serum, facial oil or moisturiser. Prime: Apply daily on cleansed skin. Can be used alone or on top of your usual skin care cream for added protection and hydration. Can also be worn under makeup as a primer. Warnings: Contains Oxybenzone - avoid contact with eyes, and rinse thoroughly if in contact with warm water. Mist: Aqua (Water), Propanediol, Glycerin, Polysorbate 20, Ribose, Sodium Benzoate, Mica, Propylene Glycol, Phenoxyethanol, Potassium Sorbate, Parfum (Fragrance), Polypodium Vulgare Rhizome Extract, Geraniol, Limonene, Aloe Barbadensis Leaf Juice Powder, Disodium EDTA, Panthenol, Citronellol, Citric Acid, Amaranthus Caudatus (Velvet Flower) Seed Extract, Sodium Hyaluronate, Linalool, Mentha Aquatica Extract, Tin Oxide, Cetraria Islandica Thallus Extract, Sphagnum Magellanicum Extract, Biosaccharide Gum-4, Citral, Farnesol, Sorbic Acid, CI 77891 (Titanium Dioxide). Prime: Aqua (Water), Octocrylene, Ethylhexyl Methoxycinnamate, Caprylic/Capric Triglyceride, Benzophenone-3, Acacia Decurrens/Jojoba/Sunflower Seed Cera/Polyglyceryl-3 Esters, Butyl Methoxydibenzoylmethane, HDI/trimethylol Hexyllactone Crosspolymer, Tapioca Starch, Schinziophyton Rautanenii Kernel Oil, Butyrospermum Parkii (Shea) Butter, Stearic Acid, Glycerin, Butylene Glycol, Glyceryl Stearate SE, Phenoxyethanol, Benzyl Alcohol, Sodium Stearoyl Glutamate, Tocopheryl Acetate, Parfum (Fragrance), Polyhydroxystearic Acid, Geraniol, Limonene, Citronellol, Xanthan Gum, Linalool, Alumina, Aluminum Stearate, Disodium EDTA, Ethylhexylglycerin, Dehydroacetic Acid, Silica, Sodium Stearate, Polymethylsilsesquioxane, Disodium Rutinyl Disulfate, Hordeum Distichon (Barley) Extract, Melissa Officinalis Leaf Extract, Sodium Benzoate, Citral, Citric Acid, Farnesol, CI 77891 (Titanium Dioxide).